A few weeks ago I launched my Wearable Wardrobe Guide. If you missed it, you can see more info here. In the introductory email to the guide, I asked you guys to tell me your biggest issue with your closet. I’ve received hundreds and hundreds of responses, and so many of you said you don’t know how to put together simple, casual outfits. Something more than just jeans and a tee and flip flops. Today I’m going to give you a really easy basic outfit idea that’s just as comfy and easy as jeans and a tee, but it looks a heck of a lot more pulled together. First, pick a top with some interest. 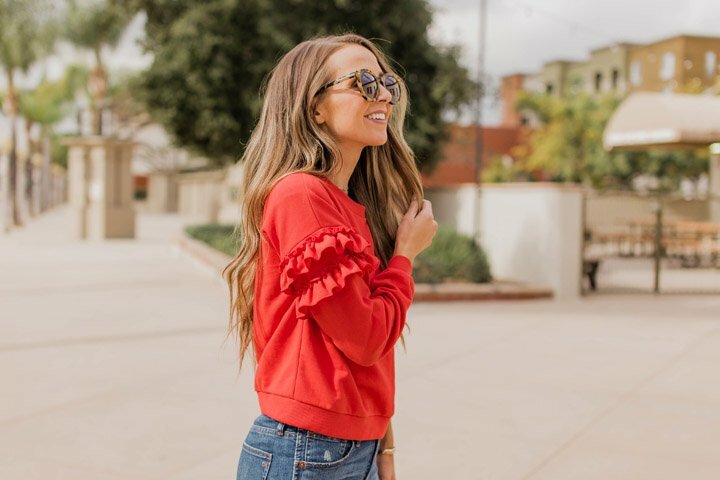 You know I love t-shirts, but a ruffle sleeve top, a cute sweater, or a graphic tee adds some personality! Second, choose a really good shoe. Just stop it with the rubber flip flops. I’m obsessed with mules lately because they’re a great grab and go pair that looks super pulled together. 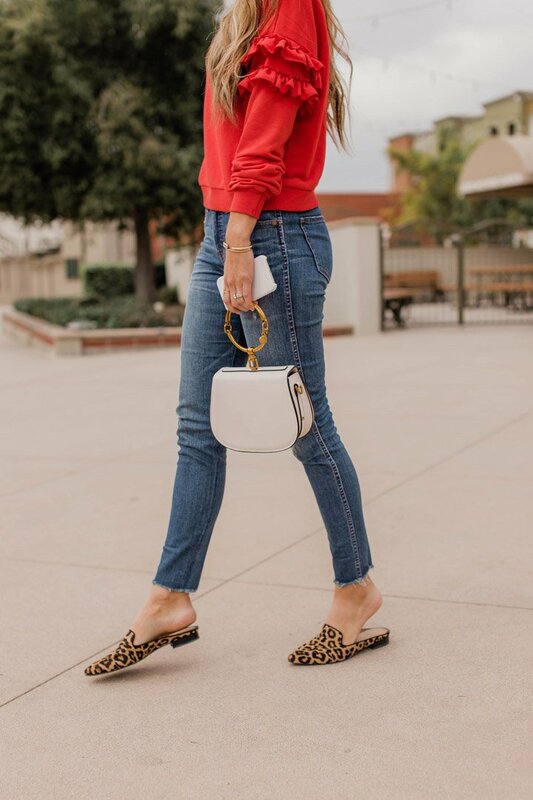 This leopard pair and this brown suede pair are my go-to’s currently. These little flats under $25 are also so cute, or you could do a sneaker like this pretty platform pair. Pro Tip: if you want your outfit to feel more “grown up,” get a pair of almond or pointed toe shoes. They instantly elevate and mature your look, and they’re way more flattering to your leg line. Trust me. No rounded toe flats, please. It’s really takes no more effort, but your outfit looks so much better. If you need more Momiform ideas, I have an entire tab dedicated to them on my blog right here! 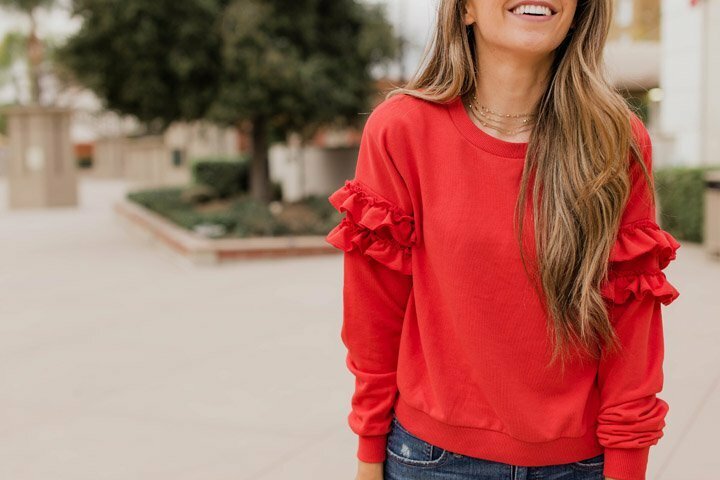 That ruffled sweatshirt is so cute! love love love that outfit, i love the red top for spring. it’s so unexpected and cute. not to mention your flats are adorable. I love that red top! I may have gone a little crazy and bought that top, and two other tops that were all the same color today haha.